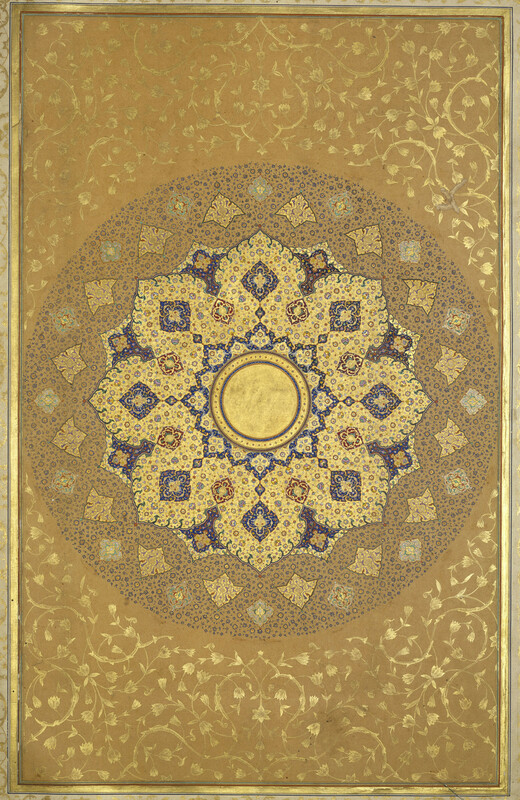 A shamsa (image of the sun) was regularly placed on the frontispiece of a manuscript made for a royal patron. According to the official historian of Shah-Jahan's grandfather, the Emperor Akbar: 'The Shamsa is a divine light, which God directly transfers to kings, without the assistance of men.' In order to create this illumination a geometric grid, which is still visible in the centre area, was impressed into the paper. Islamic divine order is expressed here symbolically through geometric precision. Islamic manuscripts are read in reverse order to western manuscripts: working from back to front, and reading the right page before the left page.